The FUE Hair Transplant Treatment – This hair restoration procedure involves transplanting healthy hair follicles from the scalp to the balding or thinning areas. The FUT Hair Transplant Treatment – A strip of hair is removed from the donor area and the hair is then transplanted into the balding or thinning area. Vinci Max™ Hair Transplant – This treatment combines the FUE and FUT hair transplant treatments to cover the maximum area of baldness. Hair Transplant or Scalp Micropigmentation… Which Is Best?When faced with a choice such as whether to have a full hair transplant or to opt for scalp micropigmentation instead, it can take a while to decide. And that’s probably a good thing. Both of these procedures are serious and can take time to recover from, and should not be entered into lightly. Is It Possible To Have A Successful Hair Transplant With a Norwood 6-7 Stage Hair Loss?For many men, a hair transplant represents the ultimate way in which to achieve a full head of hair if they are balding, or their hair is thinning. And it certainly is a great process which gives those who have it confidence and a better level of self-esteem. How Many Hair Grafts Should You Expect During A hair Transplant?As with any kind of cosmetic procedure, the final results of a hair transplant won’t be known until the work has begun – or even finished. With a hair transplant, the bald scalp is covered with donor hair taken from other parts of the scalp – these donor areas as known as grafts. This advanced surgical hair restoration technique allows hair loss patients to have a chance at restoring good hair coverage. Over the years that it has been in practice and continually evolving. The Hair Transplant surgeons of Vinci Hair Clinic have over 18 years of combined experience in FUT (Follicular Unit Transfer) Hair Transplants – and are some of the best Hair Restoration specialists in Europe. Hair restoration treatments are available at a wide variety of our clinics, and we offer hair transplant consultations at most of our clinics across the world. A FUT Hair Transplant is done under local anaesthetic. A strip of hair is removed from the donor area, which is usually located at the back of the head where the hair follicles are permanent and not affected by thinning and balding. Once the follicles have been removed, they are dissected into follicular units (also known as grafts) under a microscope by our experienced hair restoration team, and prepared to be inserted into the recipient site. The recipient site is prepared by making tiny slits where the follicles are then placed. Once the follicles are placed in the slits on the recipient site, the hair will grow naturally. Our specialist hair transplant surgeons offer the most advanced, minimally invasive Hair Transplant techniques available. Our team of technicians and surgeons are highly skilled in implanting hairs, leaving no visible scarring from the extraction of the hair grafts. You can wear your hair however you want after your procedure and get back to your daily life as quickly as possible with minimal fuss and discomfort. What Results Can You Expect From A FUT Hair Transplant? Determining how many follicular unit grafts will be transplanted in a hair transplant is an important aspect of planning and designing a hair transplant for the maximum possible aesthetic effect. After the hair transplant procedure, usually within a 6 to 12 month time span, the transplanted hairs will have re-grown fully and the bald patch or receding hair line will have disappeared. The results will be totally natural-looking and permanent. Come and see us! We offer free, no obligation consultations in the heart of the city and are ready to help you make the right decision about your hair restoration. You can rest assured that nothing is more important to us than your well-being, your results and your satisfaction. We know you have a choice, but why take a gamble? Hundreds of people have put their trust in us, why don´t you join them? It´s a decision that can change your life, let us help make this a reality. Our friendly advisors are waiting to discuss the next steps with you. What can Hair Transplant Surgery do for you? Get help with your hair loss today - get in contact with one of our hair loss team. Connect with us, through social media networks or our You Tube Video Channel. I came to Vinci Hair Clinic worrying about my advanced hair loss. Being a performer under bright lights, my hair loss was a real concern. 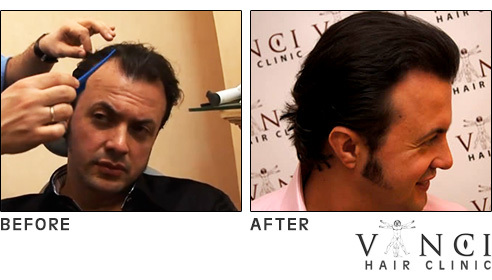 After my large hair transplant with Vinci's team in London, I achieved a fantastic result. I had been thinking about hair transplants for a long time before finally going ahead and having it done. I had all the doubts and worried if people could tell if I had it done. My only regret is that I didn't have this done a long time ago!